Remember the Maine is built on the Manhattan model, with a delightful, surprising substitution for the bitters: absinthe and Cherry Heering. With that 2:1 mixture of rye whiskey and sweet vermouth, this drink’s unknown inventor clearly subscribed to the Manhattanite school of cocktailing. A bit of whiskey-friendly cherry brandy and a taste of absinthe makes a very imaginative bitters alternative. Charles H. Baker published the same recipe in 1939 in his popular Gentleman’s Companion , under the name “Remember the Maine.” It seems that his new name won out over time. As the topical and partisan “McKinley’s Delight,” the recipe was rarely published either before or after 1939; as a patriotic memorial of the Spanish-American War era, “Remember the Maine” became a famous classic. 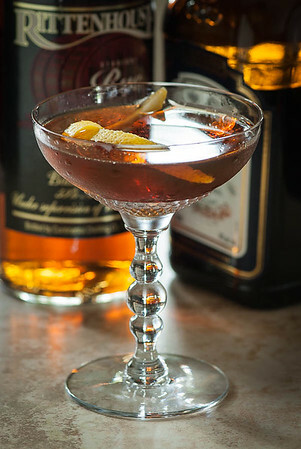 There’s one easy trick to making a first-rate Remember the Maine (or McKinley’s Delight): remember the Manhattan. Specifically, remember to use restraint with the absinthe and Heering—they easily overpower the base flavors of the whiskey and vermouth. Just as excessive bitters will unbalance and ruin a Manhattan, a heavy hand with the Heering and absinthe will will make a terrible muddle of Remember the Maine. Wash a chilled cocktail glass with absinthe or substitute. Stir the first three ingredients with ice, and strain into absinthe-coated cocktail glass. Optionally, garnish with a lemon twist or brandied cherry. Whiskey: The original 2:1 recipe provided by Crockett and Baker is too sweet. The vermouth, Heering and absinthe all bring sugars to the mix, so I recommend upping the whiskey to a 4:1 proportion. If you enjoy Manhattans a bit on the sweet side, you may want to try 3:1, or even the original 2:1, in Remember the Maine. 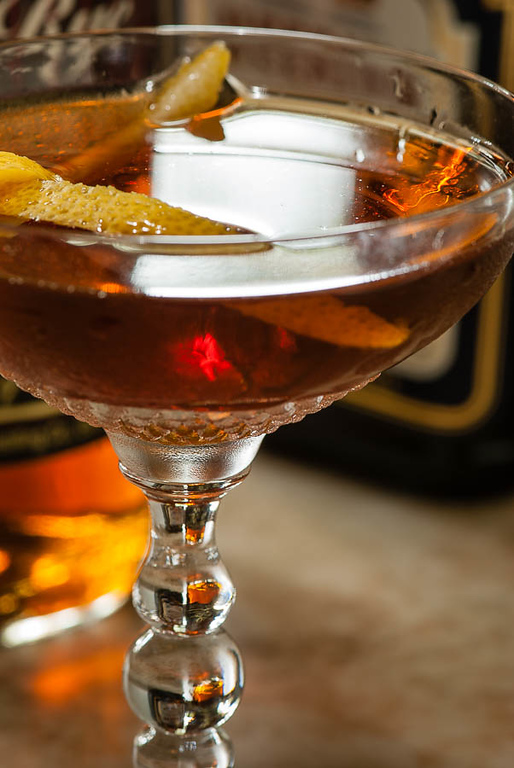 This drink is a fine opportunity for a high-proof rye like Rittenhouse 100 or Wild Turkey 101. Vermouth: I use my standard M&R Rosso, and it works very nicely in this recipe. Heering and absinthe replace the Manhattan’s bitters. The Heering is an excellent liqueur with good, clean natural flavors, but it is sweet, and has that self-important cherry aggressiveness. The surprise for me is the way Heering combines with absinthe to provide a very complex mix that is neither cherry nor anise. It is a dark, rather earthy combination that reminds me of… chocolate. I’ve read descriptions of Cherry Heering that included a chocolate note; I’ve never been able to taste it, but with the addition of absinthe the chocolate notes really light up—and combine very elegantly with the whiskey and vermouth. The Kübler is a relatively light absinthe, which is likely the key to equal parts working well; you may have to adjust for other absinthes or substitutes. “Remember the Maine” at cold-glass.com : All text and photos Copyright © 2012 Douglas M. Ford. All rights reserved. Looks strong, but thats the way I like my drinks…as well as my men…lol. Absinthe scares me though…lol. Yes, it’s a drink with some backbone–especially with the 4:1 whiskey ratio. If proper absinthe isn’t your preference, this drink would work just fine with one of the wormwood-free substitutes like Herbsaint. After all, that’s the way it’s been made for over a hundred years. Absinthe’s return is pretty recent in the scheme of things. Give it a try. And I hope you enjoy Remembering the Maine. I love it when people agree with me. Makes a nice day brightener sometimes. Funny, but my wife feels the same way..Absinthe is tough, but it does add something (in moderation). This is what I want in my mouth right now. Sadly, I only have the whiskey, so I’ll just stick with that for tonight. As much as I love the recipes– the glass featured in your Countrypolitan makes me want to do crimes to acquire them. Please take pity on us Wild Cocktailians in NOLA and tell where I might purchase them please? Much of my stemware came from antique shops, which is to say that I have no idea who their makers were. I do know that the glass in question (from the Countrypolitan post) is Vera Wang Wedgwood; the pattern might be “Duchesse.” The bad news for us both is that the coupe seems to be out of production; at least, Google doesn’t seem to be able to find it. I’d love to have at least one more, myself. I wish I could be more helpful.